A Vegetarian and a Meatlover Sharing ONE Handuraw Pizza??!! 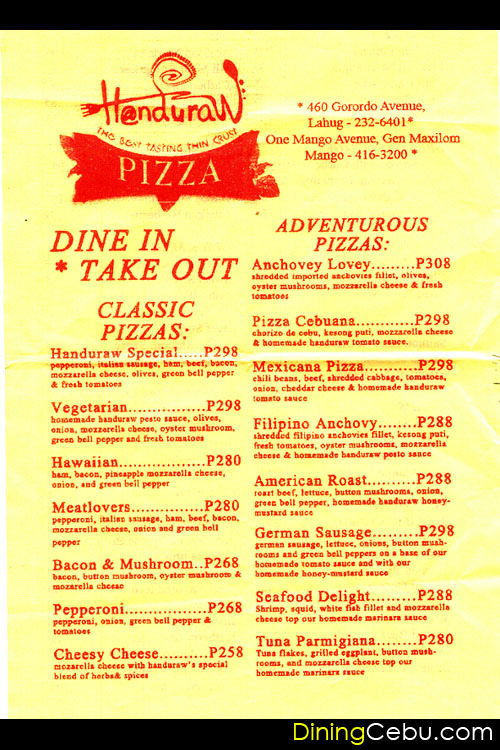 I have always loved Handuraw Pizza way back when it still had a branch adjacent to Kahayag Cafe in Mabolo, Cebu City. Pakalista Jon and I happen to be in One Mango Avenue and just had to grab a Handuraw Pizza. Big problem though -Jon is a VEGETARIAN and I’m a MEAT LOVER! What to do???!! The good thing in Handuraw is that you can choose two flavors in one pizza. So one half is the Handuraw Special and the other half is the Vegetarian Pizza. I like the Handuraw Special Pizza because it has a very thin and crunchy crust. The toppings I like as well because they complement each other and you can really taste them individually. I find it slightly bland for my taste but still I like it. The Handuraw Vegetarian Pizza did not disappoint as well. The flavor is very subtle and light perfect for a vegetarian’s taste buds! 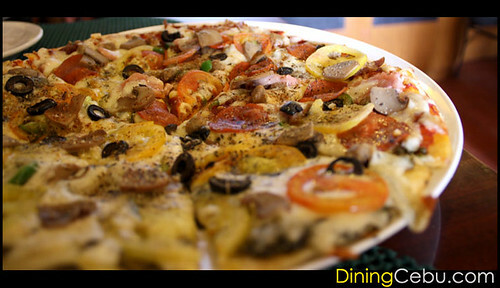 Handuraw Pizza is definitely one of the best and affordable pizza restaurants in Cebu. With all the pizza places the Pakalistas have gone to, I’m sensing a Battle of the Pizzas review coming! But before that, go check out Handuraw for their other Classic Pizzas or Adventurous Pizzas! Check out unique pizza recipes at Foodista! First time here in DiningCebu.com? You might wanna subscribe to the RSS Feed or subscribe by Email so you won’t miss out any of the cool updates! I like the adventurous line best. The ones you think would never work, especially on pizza, but they do. Like the Tuna Parmigiana (my favorite), which has tuna and eggplant and marinara sauce. Or the ginamus pizza (Filipino Anchovy). @husdamanus: hehe the chorizo is always a pinoy favorite… would love to try that one next time. @purplyana: wow you tried the ginamus? the ginamus is perfect with saging linung-ag but with the pizza that’s really interesting 🙂 the tuna and eggplant is something my vegan co-pakalista Jon would love to try. @Fedge: The ginamus has kesong puti with it and a pesto base (like the vegetarian). It’s pretty good, and you get the “oh how interesting” factor when you say you’re eating ginamus pizza. Hehehehe. Kudos for posting such a useful weblog. Your blog is not only informative and also very artistic too. There normally are extremely couple of individuals who can write not so easy articles that creatively. Keep up the great writing ! !